President Barack Obama's 53-minute "major address" on Thursday was so bad that even some of his knee-jerk cheerleaders in the establishment press couldn't stand it. A desperate Associated Press photographer thought that fitting Obama for a new halo might distract from the disaster. Nice try, buddy. No sale. Obama was right about something, though not in the sense he intended, when he told his audience that "we can’t afford to jeopardize our future by repeating the mistakes of the past -- not now, not when there’s so much at stake." We've been repeating the New Deal-"inspired," stimulus-driven, regulation-overloaded, class warfare-motivated, uncertainty-inducing mistakes of the 1930s for 3-1/2 years (or four, if you want to include President George W. Bush's $94 billion distribution of IRS checks in 2008, which in historical perspective represents a tiny drop in what is now a dangerously deep debt bucket). It's well past time to stop doing what hasn't worked, especially when we have an historical blueprint which, when appropriately adapted to our current situation, can free us from our current malaise. 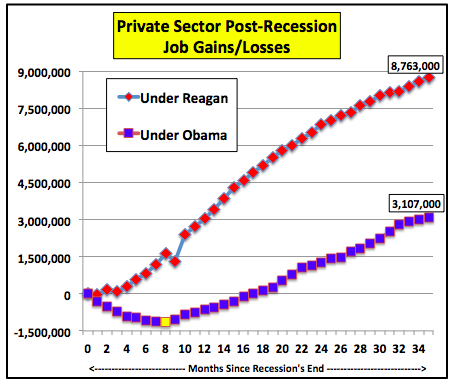 Both Ronald Reagan and Barack Obama faced deep recessions. The problems Reagan inherited from hapless predecessor Jimmy Carter and which immediately followed his inauguration were arguably more severe. Inflation in 1979 and 1980 averaged 13%. The prime interest rate was 20% the day the Gipper was inaugurated (imagine this economy, which can't get going with the prime rate at an all-time post-World War II low of 3.25%, trying to recover in the face of double-digit interest rates). Unemployment was soaring. Reagan, while facing a Congress controlled by the party of tax and spend, needed to somehow revive the economy even as the Federal Reserve under Paul Volcker was of necessity taming inflation with a very tight monetary policy, creating a double-dip recession. Despite the Obama-Pelosi-Reid stimulus, which was so flipping important that it had to be rushed through Congress without giving anyone time to read it, and which was falsely sold as a way to jump-start commerce with shovel-ready jobs which existed only on paper if at all, the economy kept on losing jobs for eight awful months after the recession ended. Under Reagan, despite arguably much more severe headwinds -- you try to bring back an economy with interest rates still above 10%, as they were until the last few months of the period involved -- robust job growth resumed almost immediately after the recession's end and kept going and going. Team Obama likes to talk about what has happened since February 2010 (the yellow mark in the chart), bragging about all the private-sector jobs "we've created" (as if they can take credit for decisions employers have made independently). The fact is that even if you ignore (which you shouldn't) the first eight months after the recession ended (actually, decisions made, laws passed, and policies implemented by Democratic administrations, Congresses, and government-sponsored enterprises created the recession, while President-elect Obama's frightening "They're absolutely right" endorsement of the occupiers at Chicago's Republic Windows and Doors worsened it), the 4.27 million private-sector jobs added during the past 27 months pales in comparison to the 7.14 million created under Reagan.